“How Small and How Old?” brought us to the point where Jeff was explaining why we really could afford to buy an airplane (a small, old airplane). Apparently, we would be paying about the same as we had paid for the car that I had bought the previous year. I wasn’t sure this was really a fair comparison, as that car was new – the airplane wasn’t. I may have mentioned that it was a small, old airplane? 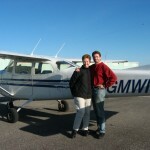 In spite of this, and the fact that I had never even been for a flight in an airplane as small as a Cessna 172, I surprised myself by agreeing readily to the purchase and two weeks later, Jeff was the proud owner of C-GMWI. 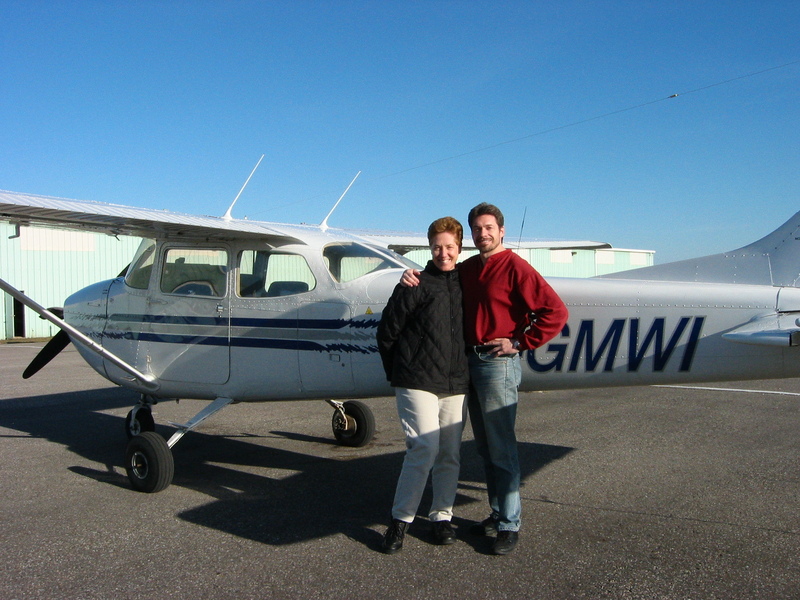 Then, about a week later, on Saturday, April 9, 2005, on a beautiful spring morning, we drove to the Buttonville Airport for my first flight in our airplane. I was very nervous. Not only had I never been for a flight in an airplane this small, but I suffer from motion sickness in cars, buses, boats and sometimes on large airplanes. As we arrived the airport, I had no idea that my life was about to completely change. I think my first clue was when Jeff drove through the parking lot and then, like he owned the place, he turned onto a small road at the end of the parking lot where there was a sign that read “Do Not Enter. Authorized Vehicles Only”. I nervously pointed that out to him and he smiled and said “It’s ok, we’re authorized”. I did like the sound of that! We parked the car in the parking lot with all the other “authorized vehicles”, some of which had license plates such as ‘GOTAFLY’ and ‘AVI8TOR’, and we went through the locked gate using the code that Jeff had been given. We walked past open hangars with big and small, new and old airplanes inside. Hangars are expensive, though, so Jeff had rented tie-down space outside. Now, keep my mind, I was picturing an old clunker – remember, “small, old airplane”. But as we turned the corner of the last hangar and Jeff pointed to our airplane, I thought “what a pretty little airplane!” In fact, it was the prettiest little airplane in the parking lot (except now I know that the ramp where the airplanes are parked is called…the ramp…not the parking lot). And that was when it started to become real for me – when I saw the plane for the first time. I was very excited. I wanted to savour the experience, so I slowed down and walked towards the airplane in awe. This was our airplane! This airplane was going to take me up into the sky! Seven years later, I often still get the same feeling when I walk up to the airplane. When Jeff conducted the passenger safety briefing, I started to get nervous again. He explained that he is required by law to give the briefing, but I didn’t like hearing about the emergency locator transmitter and how to use the fire extinguisher. And the phrase “in the event of an ‘off-airport’ landing” didn’t do anything to allay my fears! Next thing I knew, I was buckled in, Jeff started the plane, conducted all the ground checks, talked to the ground controller, taxied to the runway and radioed to the tower that he was ready for takeoff. Once cleared, he taxied onto the runway, smoothly advanced the throttle, and we were off! A few seconds later, I looked straight down into someone’s back yard and felt dizzy! “That’s a long way to fall”, I thought. As we climbed up over the residential area and the houses and cars became smaller, I quickly overcame the fear of falling and started to really enjoy the flight. I marveled at the sparkling swimming pools, tiny turquoise shapes surrounded by green grass. The traffic on the highway, even though it was a Saturday, was heavy, and I felt free, zipping along above the cars and trucks. I pointed out golf courses and other landmarks such as malls and parks. Our plan was to fly north-east towards our cottage and that route took us right over my sister’s house. Then, we were over Lake Scugog and it amused me to notice that the lakes look the same from the air as they do on a map, except not as blue! As we continued north-east, we flew over the little towns that we drive through on our way to the cottage and before I knew it, we were flying over our cottage. At that point, as we circled over our lake, I did start to feel a bit of motion sickness, but I was enjoying the flight so much, I was able to ignore it. Once Jeff leveled off and flew straight, the feeling went away. On the way back to Buttonville, Jeff began to explain some of the procedures and I became very interested. He suggested that I take control. With trepidation, I gingerly flew for a few minutes before handing the controls back to Jeff. But, that small taste was enough.